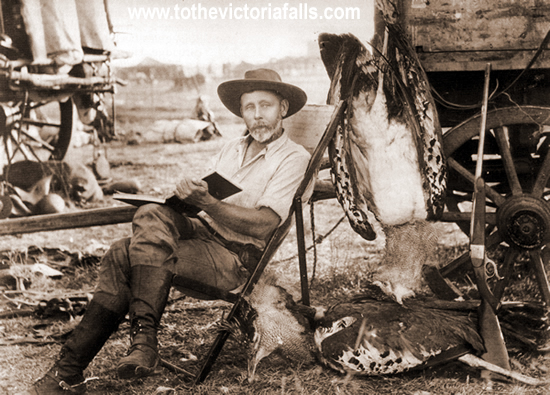 Many followed in Livingstone’s footsteps to the Falls - explorers, missionaries, hunters, prospectors and traders - travelling via different routes and means. The names of some are forgotten, whilst others published detailed written accounts of their travels. Some returned with dramatic tales of survival against adversity - and some simply failed to return at all. Thomas Leask, a hunter from Natal, arrived at the Falls in July 1869. By 1870 twenty-five Europeans are known to have visited the Falls, but there were undoubtedly others whose names have been lost. Over two years, 1874 and 1875, however, these numbers doubled, an indication of the rate at which the area was being drawn into the sphere of European activity. Frank Oates, uncle of the heroic Lawrence Oates (member of Robert Falcon Scott’s ill-fated expedition to the Antarctic), arrived at the Falls on New Year’s Day 1875. Oates was one of the first European to see the Falls in full flood, but succumbed to fever on the return journey, sadly without updating his journal. Frederick Courtney Selous, the British explorer, hunter and pioneer conservationist, visited the Falls for this first time in June 1874, returning in October 1877. Returning to the Falls a third time from October to December 1888, Selous recorded a different scene. Selous was described by Roosevelt as ‘the last of the big game hunters,’ but as early as 1881 even Selous was lamenting the decline of the elephant herds. He also expressed concern about the reduction in the number of white rhinoceros from his experiences on the Chobe River, where in 1874 the animal had been a common sight. In 1877 only tracks could be found and by 1879 even those had disappeared. The conclusion was inevitable; “it must be almost extinct in that portion of the country” (Selous, 1881). He repeated his misgivings in 1893, convinced that the species was “upon the verge of extinction... some few white rhinoceroses no doubt still survive, but it is not too much to say that long before the close of the century the white rhinoceros will have vanished from the face of the earth” (Selous, 1893). Another visitor to the Falls was Richard Frewin, who arrived in August 1877 and commented that it was a great pity that so very few people would ever see them. Decle L (1898) Three Years in Savage Africa London. Gibbons A St H (1904) Africa from South to North. Through Marotseland. Lane, London. Oates, Frank (1881) Matabele Land and the Victoria Falls: A Naturalist's Wanderings in the Interior of South Africa. C.G. Oates, editor. London: C. Kegan Paul and Company. Selous, Frederick Couteney (1881), A Hunter's Wanderings in Africa. London. (Rhodesia Reprint Library, Vol 14. Books of Rhodesia, Bulawayo, Zimbabwe. Selous, Frederick Couteney (1893) Travel and Adventure in South-East Africa Being the Narrative of the Last Eleven Years Spent by the Author on the Zambesi and its Tributaries, with an Account of the Colonisation of Mashunaland and the Progress of the Gold Industry in that Country. London: Rowland Ward and Co.